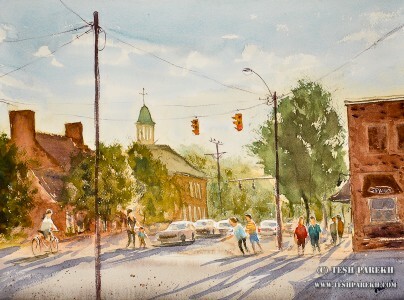 I did this plein air painting couple of months ago on location in Chapel Hill. Earlier this year, I had done Jennifer & Ben’s live wedding painting commission in Chapel Hill (check that out under my Wedding & Event paintings portfolio). Franklin Street area of Chapel Hill is always busy! I drove around the Franklin Street on a Sunday and liked this view of Columbus Street. The restaurant on the corner is Spanky’s. I setup outside the Ackland Art Museum (I have also done a live painting at Top of the Hill restaurant upstairs). It was a warm afternoon. Many people stopped by to check out what I was panting. I saw some fun things as I painted! You always do on the Franklin Street! “Chapel Hill Afternoon”. 12×16. Watercolor on paper. Plein air.